Secluded in the private gated Mayakoba Resort complex, the resort is surrounded by tranquil lagoons and lush vegetation with nature trails that guests can enjoy for walking, jogging and biking while listening to the sounds of nature. Learn more about Andaz Mayakoba. Catch some rays at the beach or spend the day relaxing at Andaz Mayakoba Resort Riviera Maya’s full-service spa. Then enjoy a meal at one of the hotel’s 4 restaurants. Located in Playa del Carmen, Andaz Mayakoba – a Concept by Hyatt is a 5-minute drive from El Camaleon Mayakoba Golf Course and 10 minutes from Maroma Beach. This 5-star resort is 6.3 mi (10.2 km) from Mamitas Beach Club. The guestrooms and suites at Andaz Mayakoba Resort Riviera Maya are naturally inspired with breezy, open layouts flooded with natural light and featuring refined artisan décor. Local artworks adorn the walls, and decorative tiles outfit the floors. Each room and suite includes a balcony or terrace with tropical views of the resort gardens and mangroves, the crystal clear lagoon, or the Caribbean Sea. All 214 rooms offer free WiFi, free minibar items, and flat-screen TVs with cable channels. Other amenities available to guests include iPod docks, 24-hour room service, and premium bedding. Dining is available at one of the hotel’s 4 restaurants and guests can grab coffee at the coffee shop/café. 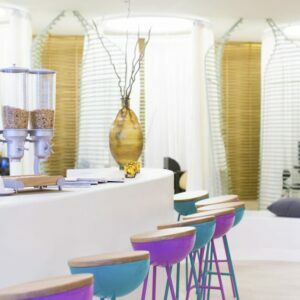 Guests can unwind with a drink at one of the hotel’s bars, which include 2 beach bars and 3 bars/lounges. High-speed wireless Internet access is complimentary. This beach hotel also offers a complimentary children’s club, a children’s pool, and an outdoor tennis court. Onsite self parking is complimentary. Andaz Mayakoba Resort Riviera Maya has designated areas for smoking. Enjoy local and international cuisine at Cocina Milagro, one of the resort’s 4 restaurants, or stay in and take advantage of the 24-hour room service. Snacks are also available at the coffee shop/cafe. Wind down with a drink at one of the 3 bars/lounges or 2 beach bars. Buffet breakfasts are available daily from 630 AM to 11 AM for a fee.